an equally titillating teaser for American musician Adam Gnade. Adam Gnade & The Hot Earth All-Stars – You Got Mean from SON on Vimeo. in the video is made possible by its truly up-close and personal nature". What better way of understanding the possibilities of a new piece of technology, than playing with it? One of our creatives Katie Harrison has set up SON with the artist Charlotte Freeston to create music promos to do just that. 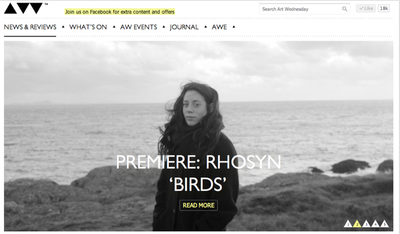 Taking influence from the recent launch of the Vine app, SON used Vine as their concept and camera for their first promo for Rhosyn -Birds which premieres on Art Wednesday. On the lyrics, Charlotte notes: "The notion of becoming a bird is finding the freedom and independence from the normal ideals that have percolated into the collective cultural consciousness through the ‘cult’ of the media. We wanted to highlight our generations addiction and constraints with social media". Inspired by Hockney’s Wolds series, Birds was shot simultaneously on four and nine iPhones housed in a makeshift structure. The Vines were then tweeted to a bespoke account using the #birds and captured on the desktop. The Vine loops were then manipulated and layered to highlight the notion of ‘cult’ through their repetition.